An amazing trench coat is not easy to find with the finest quality Suede Leather. There is a famous TV series Longmire which had the title role Walt Longmire who portrayed by Robert Taylor. 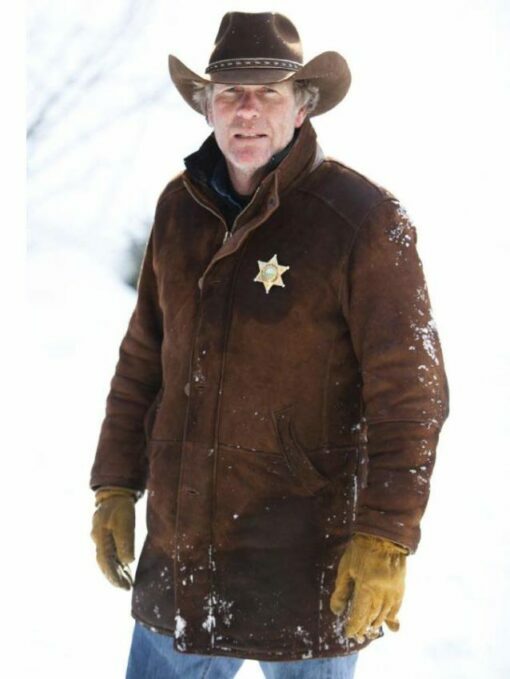 Walt Longmire wore that tremendous attire Jacket and William Jackets bring the same featured Jacket for you. This Jacket is made with the best combination of Suede Leather and viscose lining inside so you could be safe from the snowy weather. It has full sleeves and standing collar which actually one the graceful feature of Longmire Jacket. It has open Hem cuffs to accommodate your gloves under the cuffs. For your double safety, it has front button closure over zip fastening. Overall this jacket has 4 pockets, two inside and two outside around the waist. I really appreciate your Fast Customer Service and Shipment. William jacket is the best. The Coat “Robert Taylor Sheriff Walt Longmire Suede Leather Coat” is Accurate in Size. I was worried about the Size. But now I have a firm believe in WilliamJacket. Robert Taylor Longmire Coat is on the real Suede material. I Love their Quality Of Product. A classic piece to go for winters. This Sheriff Walt Coat is available in brown color and made up of real Suede material. The Robert Taylor Longmire Coat is extremely good. And that is the perfect give for the birthday. Thank you William Jacket. I’m 5’4 and a 38 chest so I ordered a size Medium. I absolutely love This Robert Taylor Sheriff Walt Longmire Suede Leather Coat. The color, Material, and Style are very stylish and sophisticated. I was pleasantly surprised because the length is very good and well constructed with great alteration. Keep warm with this durable lined fabric. Very nice online store service and will be totally buying from them again. This Robert Taylor Longmire Coat is the marvelous piece of Art. Thank you William Jacket. As I have to work over the open field most in the freezing area. I came home on vacations and find this jacket as a gift from my wife. It has good material to wear over my fieldwork. To keep safe from the cold, I found it really helpful with its decent styling. Although I am a big fan of Robert Taylor Sheriff but never notice his attire as to be part of my own wardrobe. Since I found it over the crawling online on the web I order it and get it from William Jacket, that was really worth not because of it’s my favorite character attire but it really worth to wear. This jacket got my attention just because of it decent styling and brown color. Especially suede leather makes it more in comfort wearing. After taking this jacket I found that in the description it is from Longmire TV series. I have decided to watch that series because of my jacket.